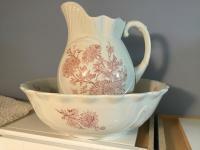 this water pitcher and wash basin was my mother’s and has been mine for the last 40 years. We are downsizing and I must let go of many precious things. Please email if interested.